I need not have worried about the garden during my absence this month. There has been a lot of rain here in Worcestershire but with just enough sunshine and heat to encourage flower. As a result the plants are looking very healthy and there are some stars. The first is Crambe cordifolia. I have two plants, one of which has not flowered for 3 years. I had intended to dig out that plant and discard it but just didn’t get round to it…. and it has flowered this year, not to its expected height of 2.5 metres but to 1.5 metres and 2 weeks ahead of my other plant. 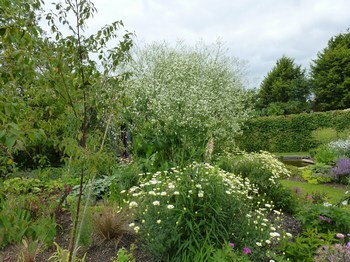 This is in full flower as I write this on 1 July – a frothy mass of foamy flowers –stunning. I have staked the individual flower spikes so it has survived the recent winds. The second “treasure” at the moment is Pilosella x stoloniflora ‘Phil Clark’. 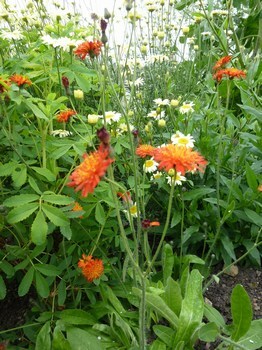 I mentioned it in my December 2011 blog and it is a very attractive burnt orange colour with neat foliage. It has been flowering for weeks now with many more to come. So thank you again to the member who gave it to me. We had an enjoyable and interesting time in Scotland at the weekend organised by the Scottish and Northern Borders Group. At the evening lectures we heard about the joys of growing peonies as well as all those damp loving gems such as primula and blue Himalayan poppies that I can only dream about – but certainly cannot grow. During the two days we visited 6 gardens, each with different interesting layout and plants. Then we had the Summer Gardens Day on 30 June, organised by the Hertfordshire Group. Despite the weather forecast for heavy showers we did not have rain. The gardens included two immaculately managed suburban gardens belonging to members. The planting combinations were inspiring so I have lots of ideas for changes to my own garden. The “experience of the day” was a visit to “The Barn” garden of Tom Stuart-Smith at Serge Hill and that of his sister Kate. What a privilege and a treat! I could not give an adequate description in this blog. Both gardens were beautiful – you will have to visit for yourself when they are open through the National Garden Scheme. Posted on August 3, 2012, in News 2012 and tagged borders group, flower spikes, growing peonies, northern borders. Bookmark the permalink. Leave a comment.